The Canadian dollar is rallying against a basket of currencies to finish off the trading week. The loonie was given a much-needed jolt on Friday thanks to a strong January jobs report. But the gains were capped by falling crude oil prices that have cratered 5% over the last week. According to Statistics Canada, the national economy added 66,800 net new jobs last month, fueled by the private sector. The latest labor force report found that the unemployment rate ticked up 0.2% to 5.8% because more people searched for work than in December. The median estimates pegged a gain of 8,000 jobs and a jobless rate of 5.7%. The largest gains were found in the private sector, led by services (99,200 positions). But the biggest losses were led by goods-producing industries (32,300 jobs) and self-employment positions (60,700). Meanwhile, year-over-year average hourly wage growth last month was 1.8% for permanent workers, up from the previous month’s reading of 1.5%. But growth was still below the May peak of 3.9%. In other data, the Ivey Purchasing Managers’ Index (PMI), an important measurement of economic activity, slipped to 54.7 in January, the weakest reading since September — anything above 50 indicates expansion. Building permits advanced 6% in December, the biggest gain since May 2017. On Friday, crude, the biggest export for the Canadian economy, continued its slump as March West Texas Intermediate (WTI) futures dipped $0.01, or 0.02%, to $52.63 a barrel. Oil is on track for a weekly loss of 5%, lowering its year-to-date gains to under 14%. Since Canada is an exporting nation, relying primarily on its commodities to grow the economy, global growth concerns are weighing on the loonie. Any international slowdown would negatively affect the Great White North. 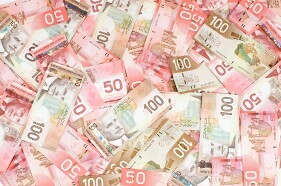 The USD/CAD currency pair tumbled 0.26% to 1.3275, from an opening of 1.3308, at 15:20 GMT. The EUR/CAD plummeted 0.36% to 1.5038, from an opening of 1.5092.